Men constitute around 81% of road accident injuries, but we tend to forget that it is not just the victims who are affected. Their families too bear the burden - economically, socially, emotionally. CAG talks to Ganesh and his sister, Sumathi about how a road accident in 2006 changed their lives. In January 2017, I joined CAG, where part of my work focuses on their solid waste management (SWM) projects. I started with the Mapping Waste Trails project, which aims to gain a better understanding of the lives of the informal waste pickers engaged in waste recycling in Chennai. Furthermore, we will be tracking the movements of certain recyclables, to ascertain the routes by which such materials traverse the city-scape, and the value added within each step in the routes. The other day, at the traffic lights, the “No U Turn” sign, with the red line slashed across the bent arrow, caught my eye. It occurred to me that these signs must be standard across the world. Otherwise, in addition to dealing with each country’s traffic idiosyncrasies, one would also have to learn and unlearn traffic signs. This got me wondering when this standardisation came about and what driving a vehicle must have been like before standards were set and implemented. Pedestrians are at the bottom of the pecking order of Indian roads. They are a group to be honked at, splashed with dirty rainwater, and given nasty looks for having the temerity to cross the road when there a motorised vehicle within a one-kilometre radius. And of course, pavements for pedestrians are a waste of space. In short, pedestrians should not be allowed to exist. Recently, I had attended a meeting on the topic of "Privatization and Commercialisation of water in India" held in Bhopal on August 10th, 2016 organized by the National Alliance for People's movement and saw participation from activists and local as well as national NGOs. On July 1, on a rather warm afternoon, over 600 students from several Chennai city colleges assembled on the Marina Beach in Chennai. 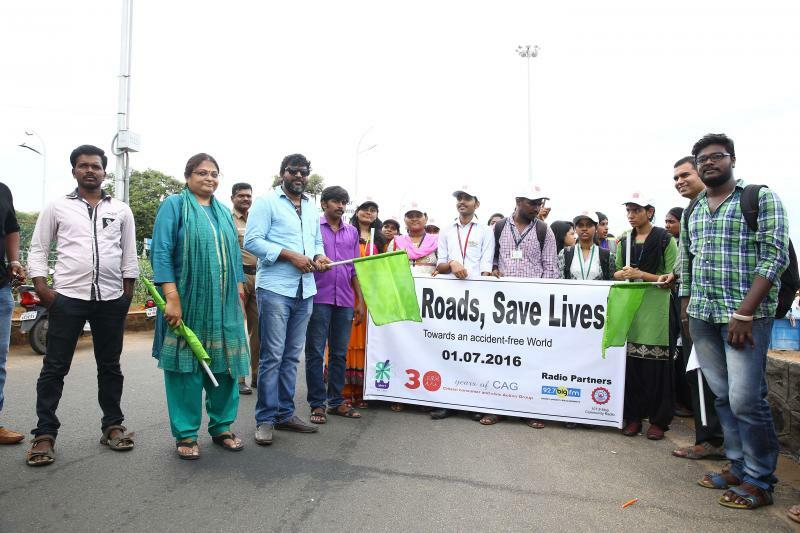 They had come to participate in public awareness programme on road safety organised by CAG. Chennai has zero community toilets. Shocking, is it not? The Corporation of Chennai has somewhere between 800 and 1000 public toilets, some of which are located near low income settlements. None of these have been designed to be community toilets though. A community toilet has several essential design features, about which I wrote in a previous blog. In the month of June I participated in the BYPASS LAB, a one week workshop organised by the Indo-German Centre for Sustainability (IGCS), IIT Madras and hosted by the Rajiv Gandhi National Institute of Youth Development (RGNIYD) at Sriperumbudur. The workshop used a combination lectures and practical exercises to train early professionals and students on data gathering, data visualization and design research. There is much to learn from the working of previously constructed community managed toilets. When it comes to public sanitation, it is the provision of facilities for the poorest that is often neglected. According to a 2011 census, only 46.9% of India’s homes have a toilet. Open defecation is prominent among those who do not have access to private sanitation facilities and posses many health and safety risks. These could be the urban poor who live in slums and informal settlements and also commuters. In March 2016, CAG and Real Charitable Trust (RCT), a Chennai based NGO working with communities on health, solid waste management etc.,inaugurated a project with a long-term vision of revitalising the Madhavaram Truck Terminal (MTT) by working with city government officials, sanitation workers, truck drivers and owners, vendors, small businesses working within the terminal to improve the infrastructure and services related to drinking water, toilets, bathing, washing and waste management.